Sensor: 2.0M pixels CMOS sensor. Still Image Resolution: 1600X1200 pixels (Format: BMP). Video Resolution: 1600x1200 pixels (Format: AVI, Frame Rate: 20FPS at VGA). Focal Distance: 5mm - infinity (when Focal distance is infinity, the microscope cannot magnify, but can be used as a webcam). Magnification: 10X-200X (adjustable). Illumination: 6 white LED lights built-in. PC Interface: USB 2.0. USB Cable Length: 165cm. Endoscope Tube Diameter: 8.2mm. 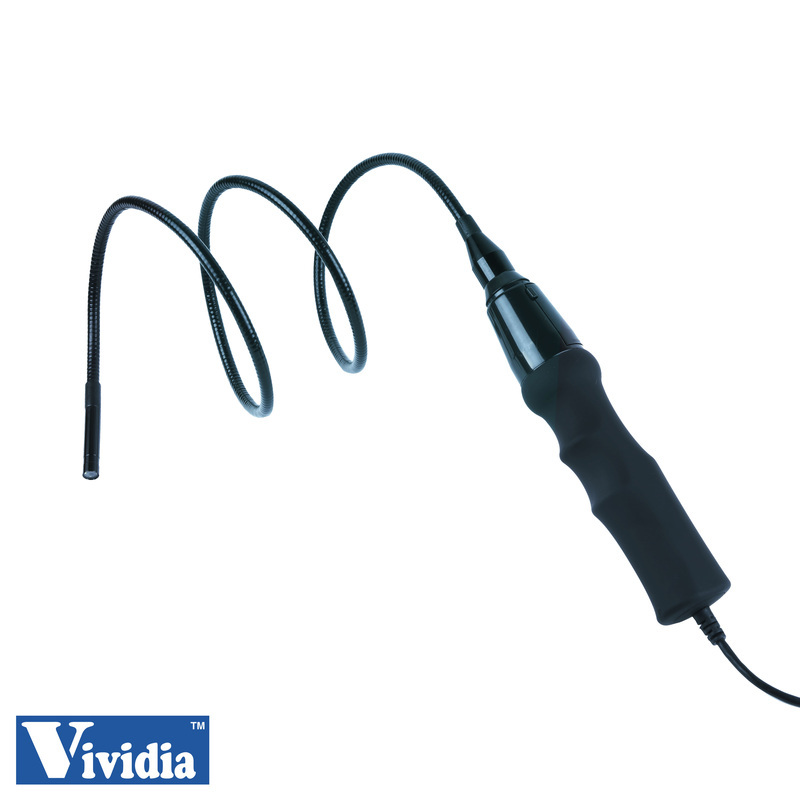 Endoscope Tube Length: 110mm. Reflector Tube Diameter: 9.7mm. Set of Accessories (Reflector Tube, Rubber Sleeve, Curette, and Plastic Sleeves): can be attached to the endoscope for different inspection purposes. Connect digital endoscope to your computer with USB cable included, and inspect small details right on your computer screen! With 2.0M pixels CMOS sensor, up to 200x magnification, and six built-in LEDs for illumination, this product allows you to view images in high resolution, take standard photos, record videos, and use as a webcam. It is easy to take snapshot by hardware button or by software control, and the images can be saved, compared and printed via software. The endoscope comes with an adjustable aluminum alloy stand, and a set of accessories (reflector tube, rubber sleeve, curette, plastic sleeves) which can be attached to the endoscope for different inspection purposes. The endoscope is multi-functional. It can be used for inspecting hard-to-reach places such as the inside of engines, machines, tubes, pipes, etc. It is also ideal for a variety of applications including textile inspection, detailed repair, printing inspection, computer parts inspection, nature observation, reading aid, collectables examination (coins, antiques), and health (skin and ear) examination. Package Includes: USB Digital Endoscope (1x), CD (1x, with User's Manual and software), Reflector Tube (1x), Rubber Sleeve (1x), Curette (1x), Small Plastic Sleeve (1x), Big Plastic Sleeve (1x), Adjustable Aluminum Alloy Stand (1x).